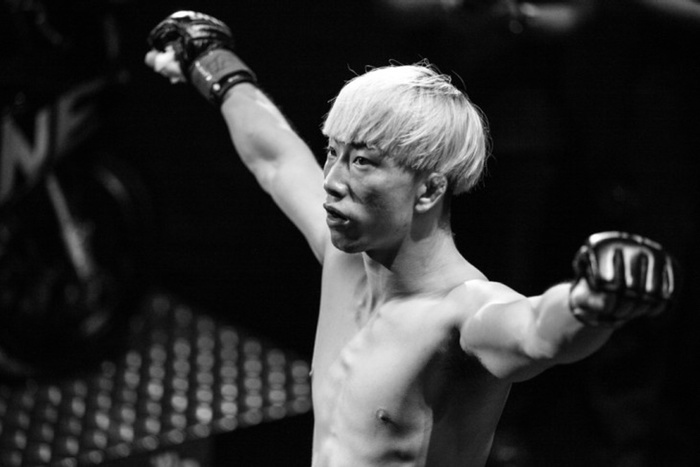 Chinese mixed martial artist Yang Jian Bing collapsed on the afternoon of December 10th during his weight cut for a match the following day and went into cardiac arrest. He was brought to San Juan De Dios Hospital in Pasay City, “unconscious and unresponsive” and died later that night. He was 21-years-old, lively and hardworking; one of the friendliest, most genuine young fighters coming up in China today. He was known for his distinctive platinum blonde bowl cut and hyperactive energy. Yang’s coaches from the Big King gym in Beijing were with him when he passed. Yang was their little brother, the best prospect they had, the one they spent so much time with in and outside of the gym. The two veterans who run the gym have to now deal with the grief, the Yang family, the rest of the fighters in the gym, and the questions, How could this happen? Doctors told reporter Gab Pangalangan Yang died of rhabdomyolysis, a condition most often associated with over-training while dehydrated. Rhabdomyolysis is when the tissues in your muscles break down from a lack of fluid and overexertion resulting in acute kidney failure and shock. You piss brown tea. You may end up in the ICU. But you rarely die from it. From what little we know about Yang’s weight cut, it sounds like he may have had kidney failure, leading to an imbalance in the electrolytes in his body and a malfunction in the electrical currents regulating his heart. The exact conditions are a mystery, but the root cause is not. Some people will say Yang’s weight cut was “botched,” but the fact is every weight cut harms the body, the question is just how much. Weight cutting is to MMA what concussions are to football. Everyone cuts weight. Missing weight is a humiliating experience, dishonorable and unprofessional. Yet the ability to cut big time weight, make weight the day-of, and then perform on fight night is a source of great pride for the many, many fighters who do so each and every week, in promotions small and large. The concept is simple. Walk around at 160, but cut weight down to 145 pre-fight, then re-hydrate back up to 160 to gain weight, strength, and maybe some height on your opponent. It’s to the point now that most fighters in the UFC compete at least 10-15 pounds below their normal weight. Very few elite fighters eschew the weight cut, Gunnar Nelson being one notable exception who doesn’t cut weight and also speaks out against the tactic. In fact several commissions have already tried to curtail fighters from putting their bodies through so much right before a fight—in Arkansas and in Massachusetts—and the Association of Ringside Physicians proposed an alternative to the traditional “sweat it out and then pour it back in again” procedure that takes such a huge toll on fighters. But it’s the fighters themselves who drive the demand for a weight cut, not the promotions, physicians or the commissions. A fighter who walks around at 155 will want to drop down to 145 rather than face an opponent at 160, because the guys at 160 are dropping down from 180 or more. No one can stop until everyone stops. Not only that, but the tradition of making and cutting weight is part of the training process, just as much as pad work and weights and cardio. It’s embedded into the way fighters prepare and a lot of fighters who can go through the process and come out the other side in good shape resent anyone coming in and telling them how to run their camps. Problems arise when standard weight cutting techniques (sweat and more sweat) are applied universally to very different people under different conditions. Now with the IV ban in the UFC, there is a high probability we will hear about fighters heading to the hospital with kidney issues, dehydration problems, and eventually another fighter with palpitations or a cardiac arrest. Just like how the deadly impact of constant concussions are finally starting to shape the rules in football (kickoffs, for example), repeated and sadly higher profile weight cut-related tragedies should eventually change the way fighters deal with their bodies. It will either take MMA’s own Bennet Omalu, or a series of tragedies like the death of a 21-year-old in a hospital far from home.